Limoges (Porzellan) bzw. Moustiers (Fayence) 20. Jh. 36-tlg. Bestehend aus Deckelterrine, Ovalplatte, Rundplatte, zwei Schüsseln, sechs Speisetellern, sechs Suppentellern und sechs Desserttellern. Porzellan, polychrom dekoriert. Manufakturmarke, bet. und bez. Sowie sechs Platzteller und sechs Speiseteller. Fayence, polychrom dekoriert. Manufakturmarke und handschriftlich bez. H. (Terrine) 17, L. (Ovalplatte) 39, D. (Rundplatte) 25,5, (Schüssel) 24, (Teller) 21,5 bis 30,5 cm. 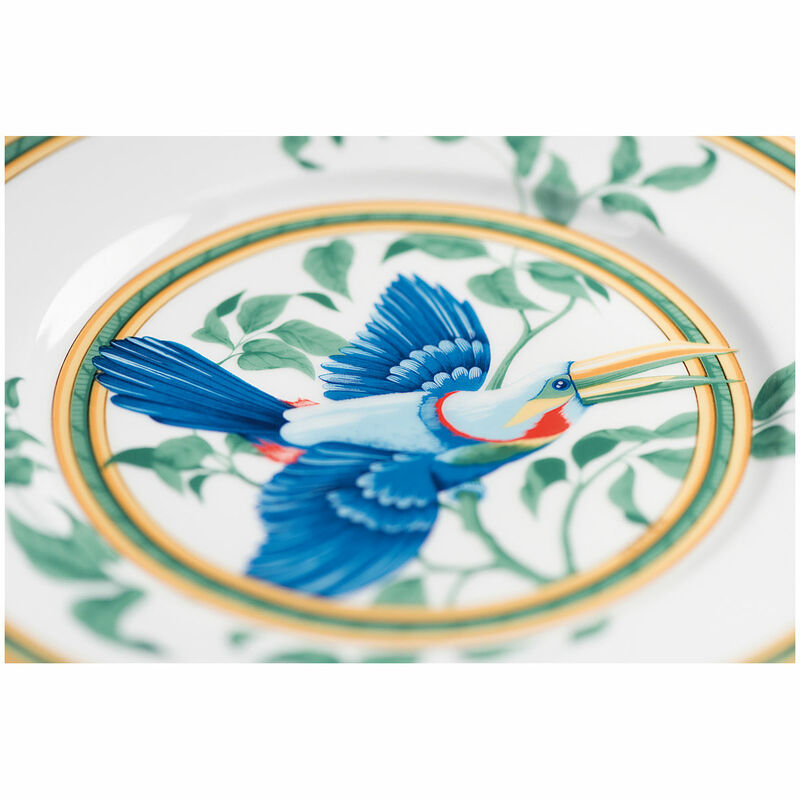 Hermès dinner service «Toucans». 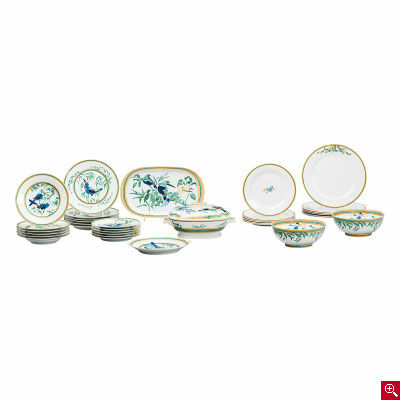 Limoges (porcelain) respectively Moustiers (faience) 20th C. 36 pieces. Including tureen with lid, oval plate, round plate, two bowls, six dinner plates, six soup plates and six dessert plates. Porcelain, polychrome decorated. Manufacturer’s mark, titled and marked. 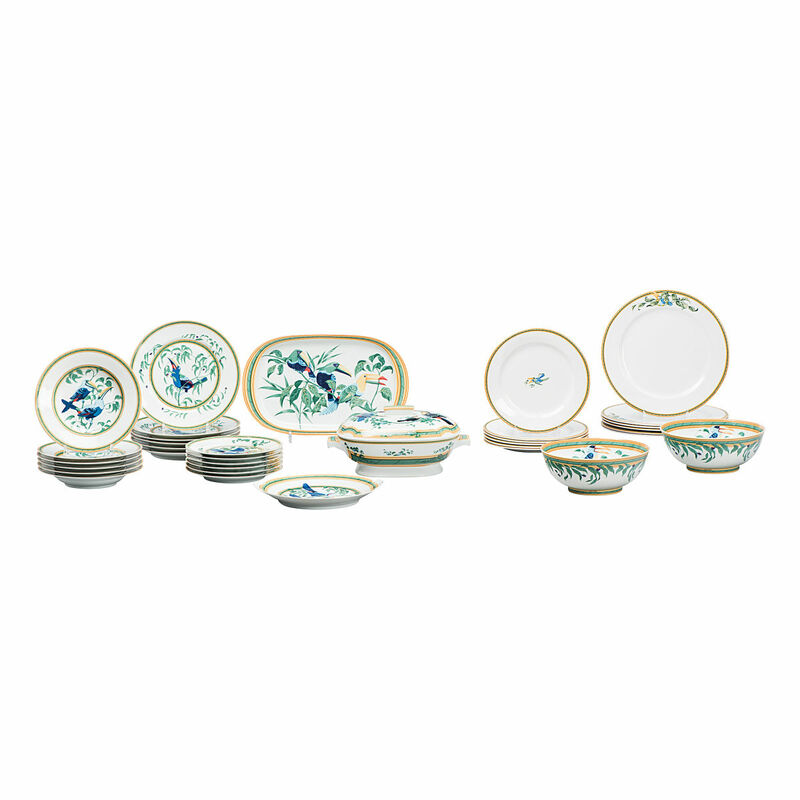 As well as six underplates and six dinner plates. Faience, polychrome decorated. Manufacturer’s mark and handwritten marked. H (tureen) 17, L (oval plate) 39, Diam. (round plate) 25,5, (bowl) 24, (plate) 21,5 to 30,5 cm.